The land which is referred to in Deuteronomy 8:8 as ‘a land of wheat and barley, of vines, figs and pomegranates, of olive trees and (date) honey’. The custom of eating dried fruit on Tu B’Shvat originated in the Diaspora; the idea was to honor fruits of the Promised Land. Here is an idea for a simple sweet for this holiday (or any other day…): Drunk figs filled with almonds (that incorporate vine/grapes/wine with figs and almonds. 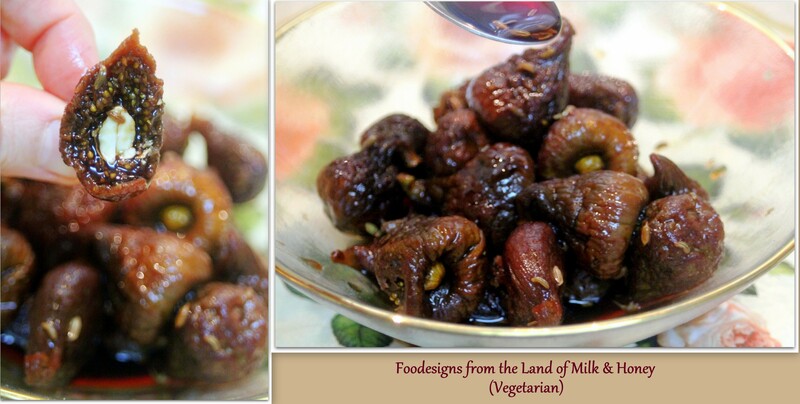 Place dried figs in a plastic or glass container. Pour red wine, brandy, a little bit of date-honey (date-molasses) or regular bee-honey over them and a bit of fennel seeds. Let the dried figs marinade overnight in the red wine, a bit of brandy, a little bit of honey or date-honey and fennel seeds (just a bit, for anise flavor). Store in the fridge and insert a whole almond into each fig once the figs have soaked the liquid. This entry was posted in Dried Fruits Sweets, Fresh Vegetable Salads, Judaism and tagged almonds, Brandy, dried figs, Jewish holiday, Judaism, red wine, Tu Bishvat. Bookmark the permalink.